Guitarist Skaff’s second CD as a leader is primarily an update of the familiar guitar-organ-drums trio format that filled urban bars with live music in the 1960’s and 1970’s. Nine of the ten tunes have this instrumentation with George Colligan handling the Hammond and E.J.Strickland on drums. Skaff’s tone is similar to Grant Green’s but his ideas are less pentatonically based and much of the material is more difficult to play than the typical group from back in that day was willing to take on. The record benefits from original tunes, six from Skaff and one from Colligan and three less familiar ones that have not been overplayed, Strayhorn’s “Lotus Blossom” , Shorter’s “Angola” and Fiona Apple’s “Fast As You Can”, which will please jazz fans who have enough recordings of standards. The quality of the performances will satisfy listeners seeking more music in this format. 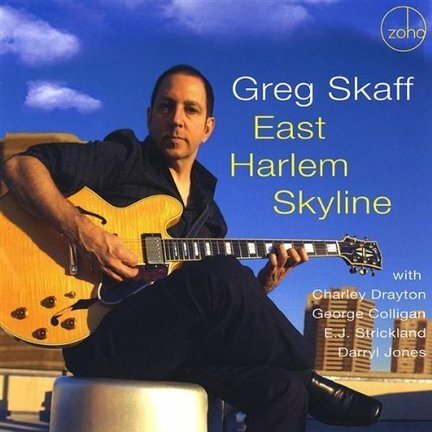 Skaff includes one very dissimilar tune, “Willie D” with a different lineup of Charlie Drayton on drums, Gene Lake on organ, and Darryl Jones on electric bass. The tune, which honors Willie Dixon, starts out with a Booker T and the MG’s type bass line but quickly adds syncopations that were definitely unfamiliar to R&B players in the 60’s and 70’s and presents Skaff with a different, wetter tone than he uses elsewhere. The performance is certainly well executed enough, but is jarringly different from the rest of the CD to the extent that it is questionable if it should have been saved for another record.